I’m somewhat chagrined that my collection of libertarian-oriented humor contains more jokes created by statists to make fun of libertarians rather than the other way around. Since everyone should have the ability to laugh at themselves, I certainly don’t mind sharing clever humor mocking libertarians (such as the how-the-world-sees-libertarians collage). That being said, I would like to augment my collection with more mockery of statists (such as Libertarian Jesus). Well, the good news (so to speak) is that the Tweedledee and Tweedledum choice that we’ve been given by the two main parties is a target-rich environment for political humor. Building on what I shared last week, let’s look at some amusing analysis of the Clinton-Trump (Clump) contest. Some masochistic readers may have watched the first Clump debate and you may even be thinking about subjecting yourself to one of the upcoming debates. 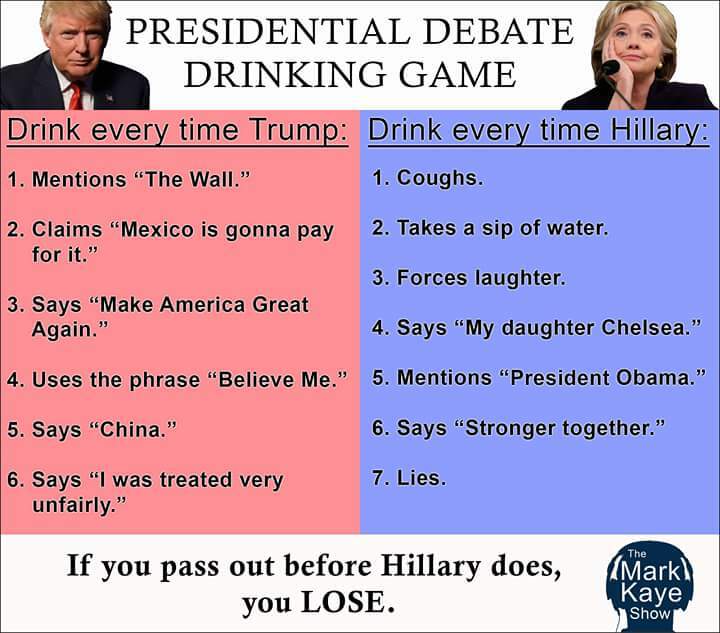 If you do, this drinking game may help preserve your sanity. But if you’re not a heavy drinker (or don’t want to become one within the first 10 minutes of the next debate), perhaps you can modify the game so it resembles the state-of-the-union bingo game I shared back in 2012. Our next bit of humor is from the folks at Balanced Rebellion, who put together this clever video giving Democrats and Republicans an option to preserve their dignity. Heck, since they equate their idea to Tinder, maybe they can even turn it into a dating service after the election. P.S. Some folks have written to ask why I haven’t produced election predictions, like I did back in 2012. I suppose I’ll force myself to do that in the next few weeks, but I can safely say at this point that America will lose regardless of who wins.